Clos de Tart (Morey-St-Denis) / Sugar of the Century, Bourgogne, Côte d'Or, October 1999. Vogel & Fitzpatrick GbR Black Ink 1998. Sylvain Pitiot definitely wanted to know our reasons why tasting his wines before making an appointment with us. You got to know that he is a man who likes to focus on making wine and who doesn't like to be disturbed by doing so. After he was convinced of our honourable interests in the Clos de tart he took his time for us and showed us around the domaine looking back on a steady tradition since the 12th century and that is now owned by Mommessin. 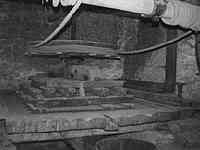 He showed us an impressive huge ancient wine press form the 17th century, that was still in use up to 1924. It was handled with a man sized wheel remaining of those that hamsters have in their cage. Beneath the press layers of grapes and straw were placed. 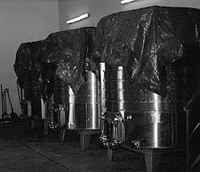 For fermentation this year brand new steel tanks were bought that already were filled with the harvest of 99. the wine in the Clos de Tart is filled into the several tanks only with the help of gravitation. From the fermentation tanks it is filled into carrel that are placed in the room aside. After that the wine is racked into barrels in the lower cellar and after that finally one floor beneath, 12 meters under the ground where it is bottled. The cellar is impressive. Straight big stone steps guide one down the 12 meters that were drawn into the stone. Everything has its unique place and is very clean. Here the wines can mature in an temperature of 12 to 13 degree Celsius and a humidity of 75%. The Clos de Tart is from a vineyard of about 7 hectares size situated in a beautiful position behind the domain on a hill side. The rows of vines are planted similar to the ones of the neighbour Clos de Lambrays. They are planted very untypical from the top to the bottom of the hill vertically not horizontally. They have special machines that can go along the vines, the height of the wheels can be adjusted so the steepness of the hill can be compensated. Driving those machines is very difficult and can sometimes a bit risky. The different yields of the various climates is brought in and processed separately so those with minor quality can be sorted out before bottling. Depending on the vintage there are about five to seven different Cuvées, that are mixed just before they are bottled. 1998 there were five of them. We tasted the second and the third one counted from the top of the vineyard. In minor years like 1991 when there was some damage because of a hailstorm no Cos de Tart is made, but it is sold as a Morey-St-Denis 1er Cru La Forge. The vintage of 1999 was harvested between the 22nd and the 27th of September before the grate rain. There are about 30 worker involved, 25 on the vineyard and about 5 in the domain. the 99 showed good natural sugar, but not too much but satisfying acidity. Extraodinaryly healthy grapes were harvested. 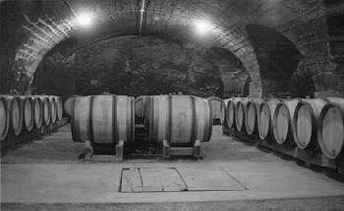 The wine is kept in 100% new medium roasted Allier barrels. This year there was a green harvest selecting about 30% beforehand. 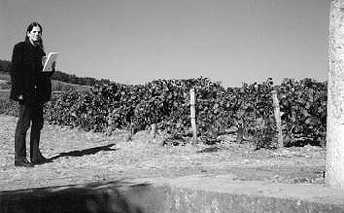 About six grapes were left on the vine while harvesting about 30 hectolitre per hectare. There is no filtering and clearing only with barrels where it seems necessary using fresh white of eggs. 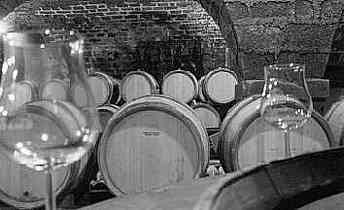 From barrels containing the wine form the harvest of the middle upper hill. Dark, blackberry red. In the fragrance blackberry and black currant. In the taste sweet blackberry, black currant, spicy notes of wood. Good tannin, not too much acidity. Plums. Colour Blackberry juice, a bit more blue tones than the other Cuvée. In the fragrance and the taste blueberry, notes of spices and pine needles. dark fruit. More closed and a bit stronger than the first Cuvée that seemed to have a broader taste. Sweet tannin and rather good acidity.. The 1998 has 13,2 to 13,8% natural alcohol and wasn't chaptalized.